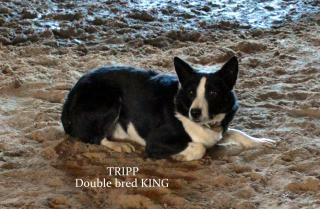 Lynn Daniel's Border Collies: Great working dogs, bred and trained. We have puppies!! Parents are Jenna & Slider, Kitt & Roy Boy, Suzie and Roy Boy. Great Bloodlines. Don't forget to click on the picture to see more pictures!! Dogs with several mths. training for sale. Demonstrations always available, cattle & sheep on hand at all times. We charge $75 to deliver your dog to the airport (not to your home). Dog crate is usually around $45 to $50.00 according to size of the dog. Customer will need to make the arrangements for shipping. Please, CONTACT US BEFORE MAKING ARRANGEMENTS! We would rather our customers come to our place so that we might get to show you our dogs working and what goes into raising these beautiful and intelligent animals. If you have to ship, we would rather go to Tulsa International Airport in Tulsa, OK if possible and try to schedule flight to leave Tulsa around midday. Will Rogers airport in Oklahoma City, OK . is another option, but we have to have the pups at the airport very early like 7am..and we live 3hrs away...so please try and ship from Tulsa airport if possible . Here are a few numbers that we have...they may have changed but you can try Delta CARGO...7100 Air Cargo Rd...bay L...phone OKC 405-316-3200..Delta Cargo # 800-352-2746. Remember to check with delta cargo summer shipping the degrees has to be correct to ship a dog. 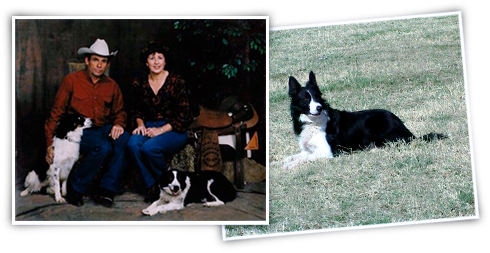 Lynn Daniel has been raising and training border collies for over 35 years. He sells pups, started & finished dogs. He strives to have the very best bloodlines possible. 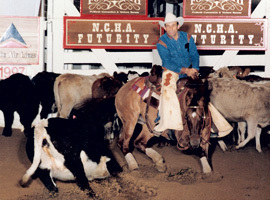 Lynn also rides cutting horses, which is how he got into training border collies. He wanted to train his dogs to turn back for him. We strive to find the right dog that will be suitable for you, whether you are looking for a puppy, a started dog, or a finished dog. GOD BLESS AMERICA!! AND GOD BLESS OUR TROOPS! !